Come and see Robson Cezar’s bottletop pictures at The Artists of Spitalfields Life opening at Ben Pentreath Ltd on Wednesday 7th November. 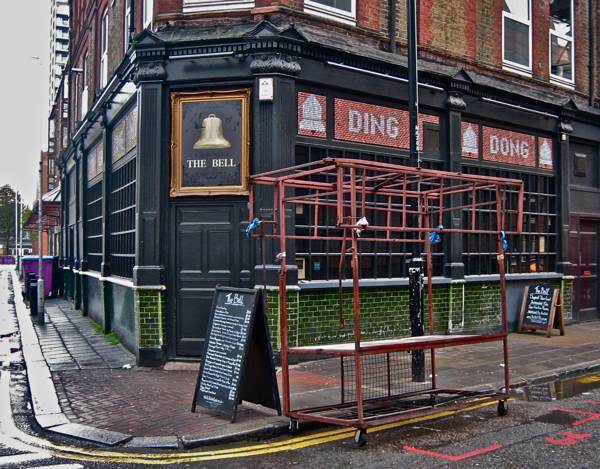 If you are a regular in the pubs around Spitalfields, you may have noticed a man come in to collect bottletops from behind the bar and then leave again with a broad smile, clutching a fat plastic bag of them with as much delight as if he were carrying off a fortune in gold coins. 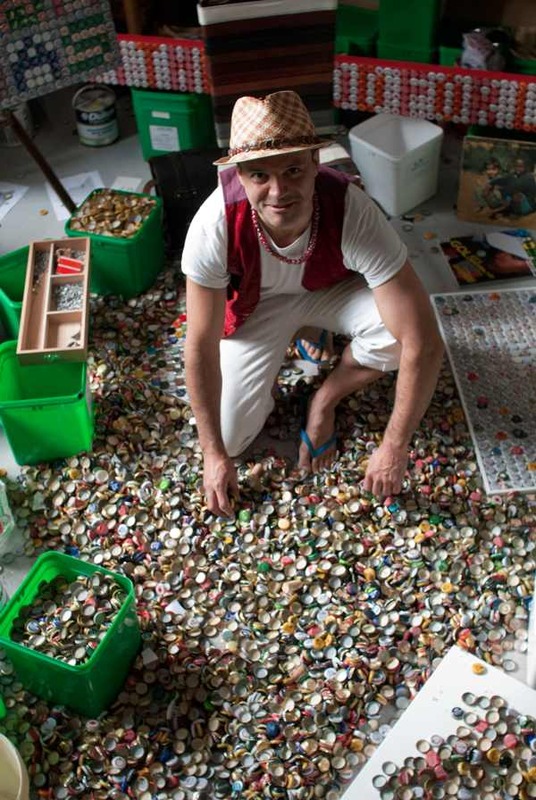 This enigmatic individual with the passion for hoarding bottletops is Brazilian artist and Spitalfields resident Robson Cezar, and he needs to collect thousands because he makes breathtakingly intricate pictures with them. 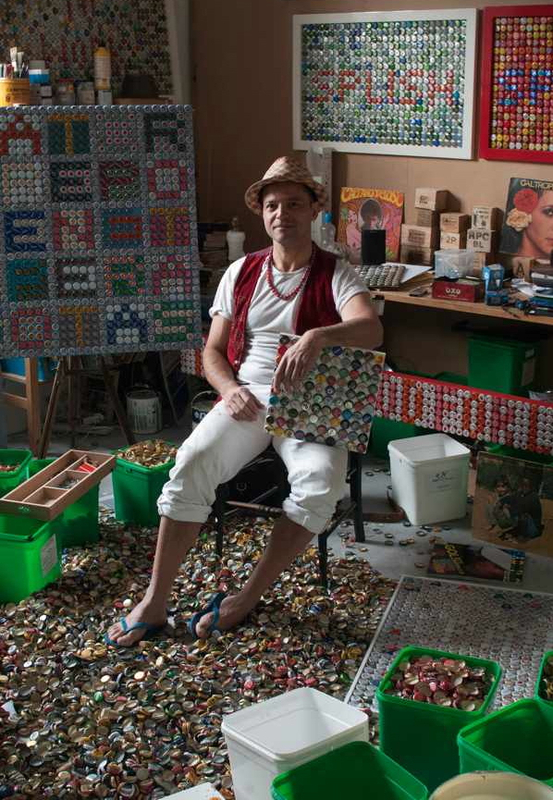 Each day, Robson cycles from Spitalfields down to his studio at Tower Bridge where he delights to store his vast trove – the king of bottletops in his counting house – spending endless hours sorting them lovingly into colours and designs to organise his finds as the raw material for his very particular art. An art which transforms these ill-considered objects into works of delicacy and finesse, contrived with sly humour, and playing upon their subtle abstract qualities of colour and contrast. 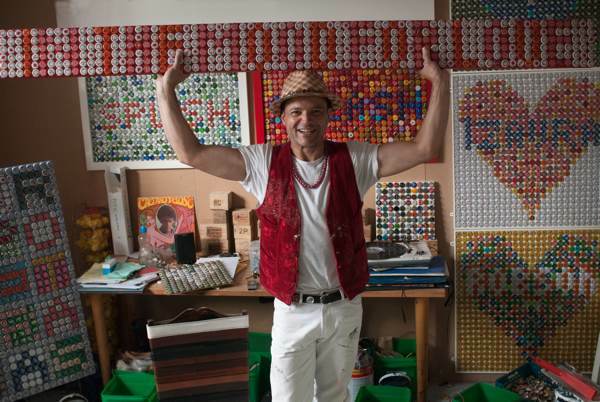 It all started a couple of years ago, when he asked Sandra Esqulant at The Golden Heart in Commercial St to collect her bottletops for him. For months she gathered them conscientiously and it gave Robson the perfect excuse to drop in regularly. 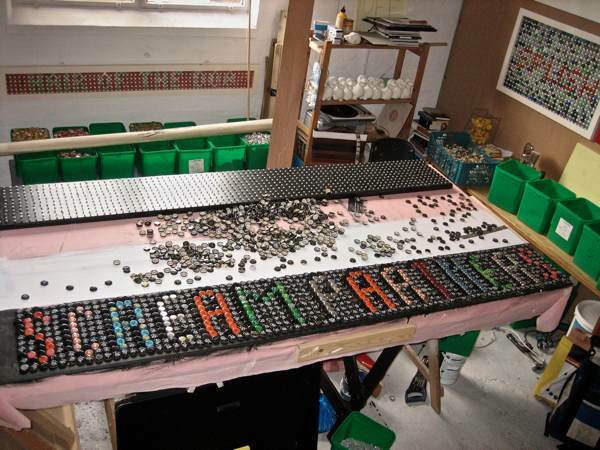 And last year, I showed you some smaller pictures he made, but over this last Winter Robson has begun creating larger, more elaborate bottletop works. 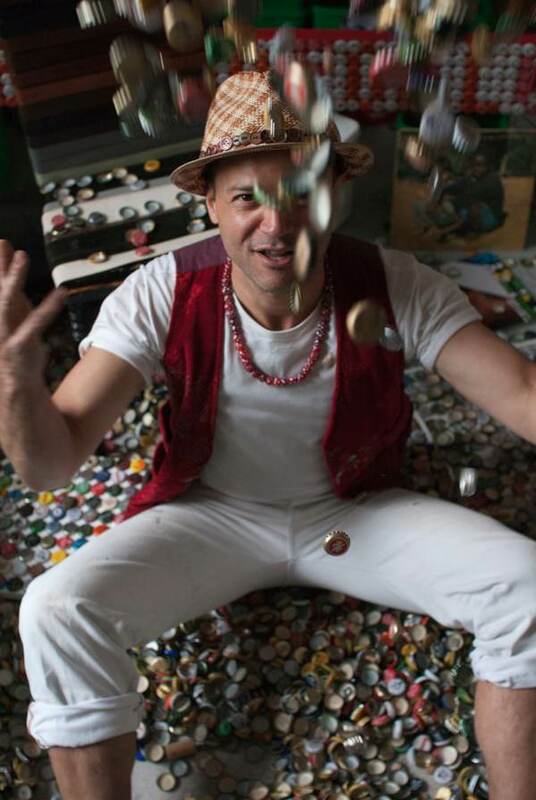 As a consequence, Robson often sets out now to visit several bars each night to collect the harvest of bottletops which he needs, that is obligingly – if incidentally – created by the thirsty boozers of our neighbourhood. And in return for the patronage of getting their bottletops, Robson makes pictures for the pubs. 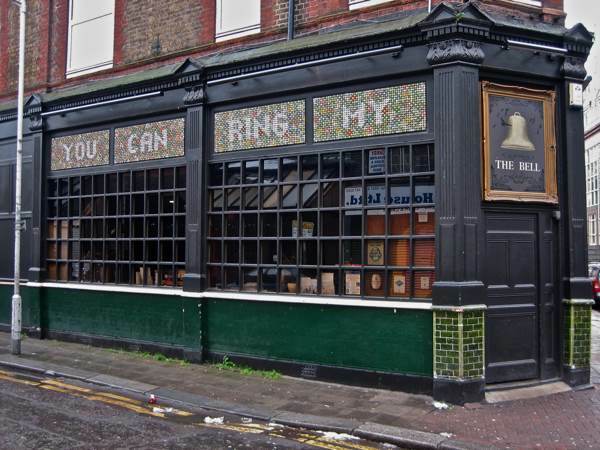 At first he made a golden heart in bottletops as a personal gift for Sandra, but when The Bell in Middlesex St offered him the opportunity to cover the exterior of the pub with bottletops, he seized the opportunity to do something more ambitious. 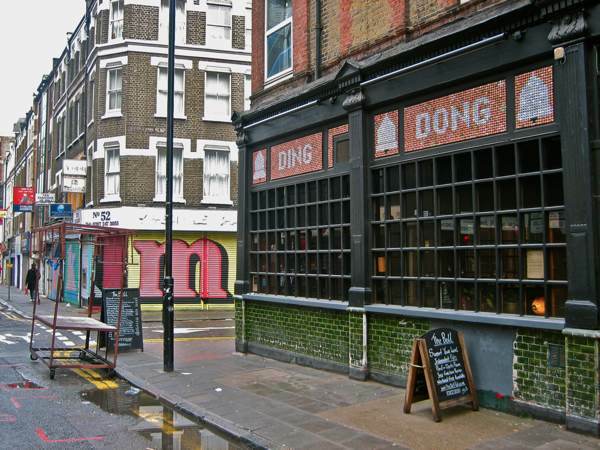 Using over six thousand bottletops, and subtly referencing the colours of the red brick and the green ceramic tiles, Robson has contrived a means to unify the exterior of the building and render it afresh as a landmark with his witty texts. And since they were installed last year, people smile and stop in Middlesex St to take photographs when they catch sight of Robson’s bottletop panels on The Bell. With such eye-catching street appeal, Robson’s work is a natural complement to Ben Eine’s alphabet that he painted on all the shutters along this street last year. 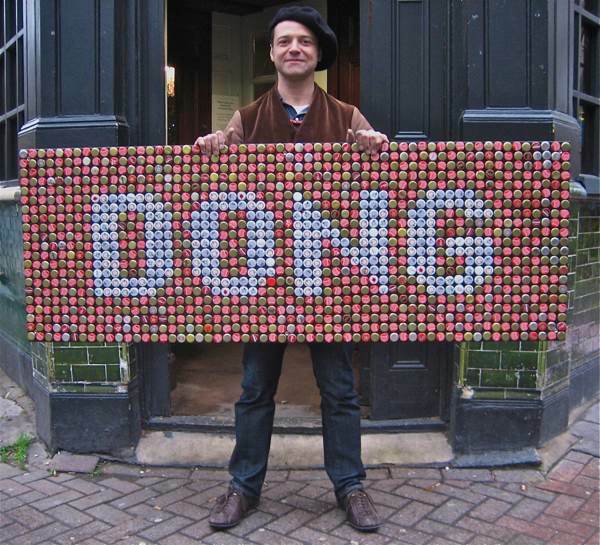 A week ago, Robson’s latest picture was installed at the Carpenters Arms in Cheshire St where landlords Eric & Nigel have been obligingly collecting bottletops for over a year. 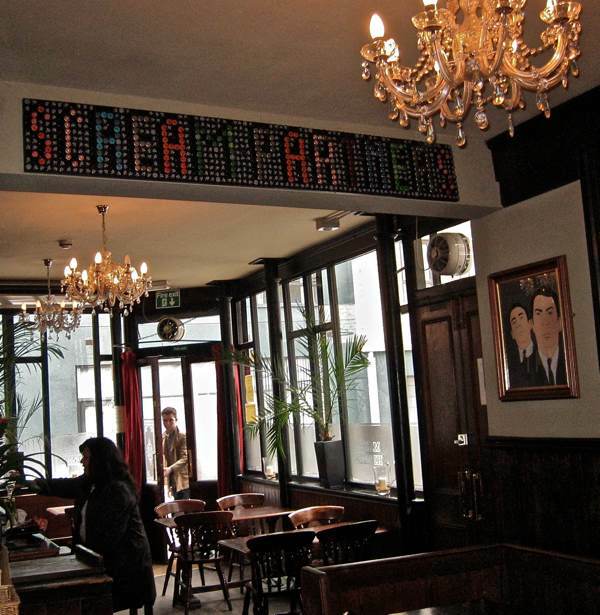 Hung up on the roof beam in the bar, this is in a different vein from Robson’s works at The Golden Heart and The Bell – creating a stir among the regulars, who are puzzling over the choice of phrase SCREAM PARTNERS for the CARPENTERS ARMS. Go round to take a look yourself and if cannot work it out at once, then a couple of drinks will increase your powers of lateral thinking. Robson Cezar came to Spitalfields in the footsteps of fellow Brazilian artist Helio Oiticica, who along with Caetano Veloso was one of the many Brazilian cultural exiles in London in the nineteen sixties. Oiticia staged an exhibition at the Whitechapel Gallery in 1967, introducing the new cultural movement of Tropicalia to Europe by recreating a favela in the gallery. And now Robson is creating his own Tropicalia here in the twenty-first century, reinventing this poverty aesthetic with a pop exuberance that reflects the cosmopolitanism of his own life experience – which began in a favela in Brazil and took him on a journey from South to North America and eventually to Europe, where he found his home in the East End of London. 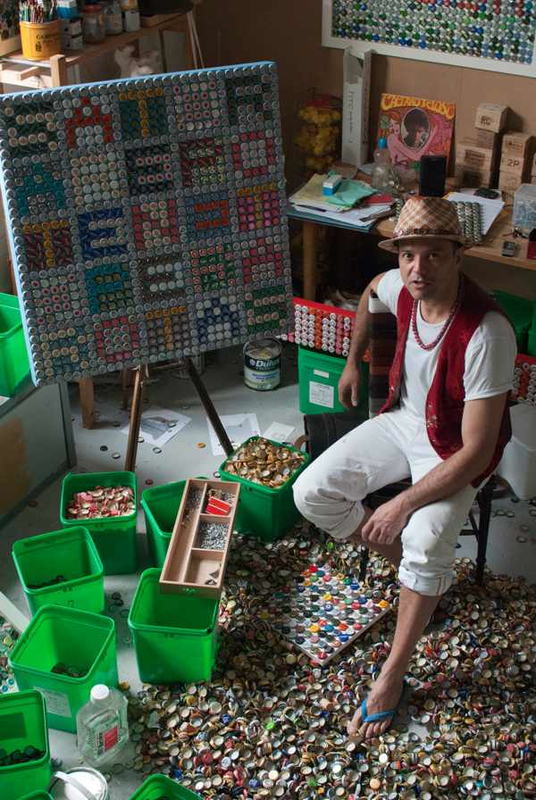 Combining the sensibility of a fine artist with the painstaking technique of a folk artist, Robson’s bottletop pictures are egalitarian in nature yet sophisticated in intent. They look like signs but they are not signs, or rather they are pictures pretending to be signs. Their exquisite technique and colouration is a crazy joke in contrast to the misrule engendered by the volume of alcohol imbibed to produce this number of bottletops. 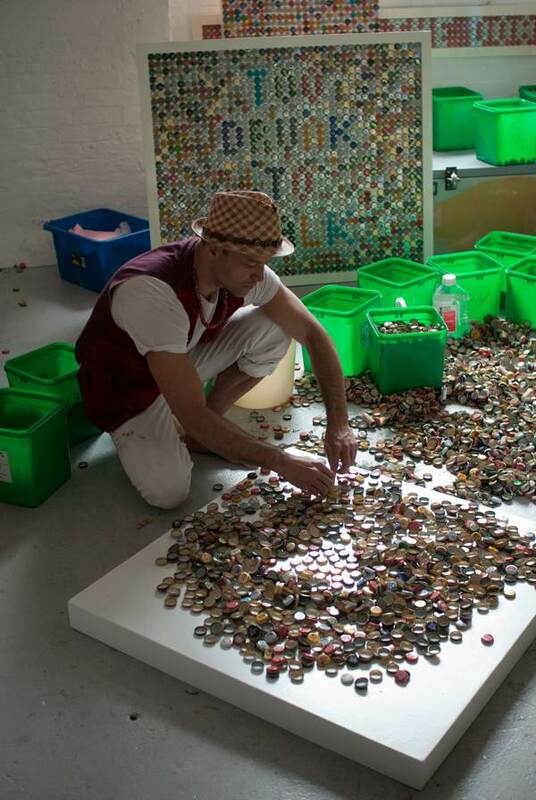 Yet the lush shimmering beauty of Robson Cezar’s work enchants us with all the bottletops that litter our streets disregarded, and reminds us of all the other pitiful wonders of human ingenuity that we forget to notice. 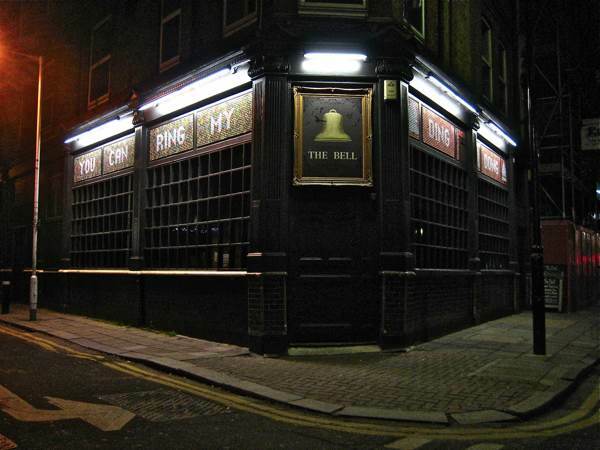 At the Bell in Middlesex St.
At the Carpenters Arms, Cheshire St.
Why SCREAM PARTNERS at the CARPENTERS ARMS? Exquisite. And reassurance and inspiration for obsessive packaging collectors everywhere. (Me: milk bottle tops, corks and tea boxes. Recycling at it’s best. Lovely! 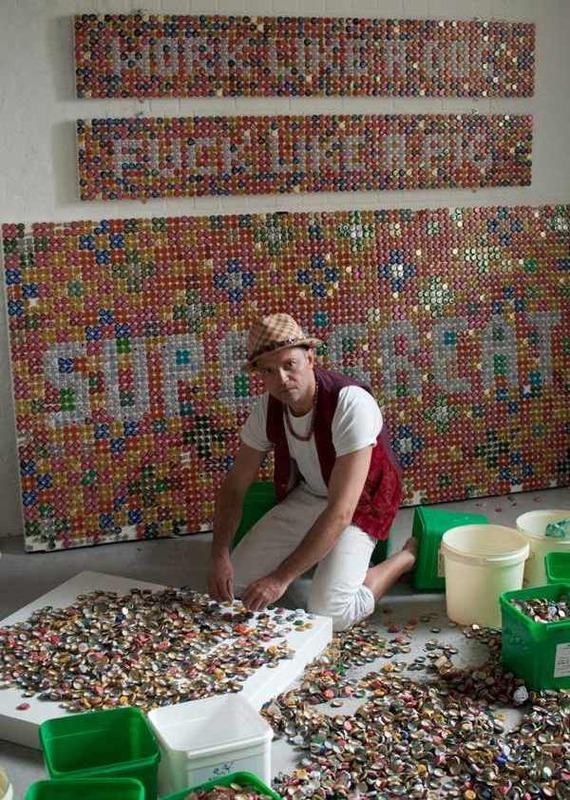 Inspiring and a very clever idea – modern mosaics. Now what can I find floating around that I would otherwise throw out that I could turn into mosaics? Great article, you seem to be a rare original Robson and really like just that glimpse of inspirational items on the table in the last photo. I’m really going to keep an eye open for examples of your work.